Homemade beef jerky is a tasty and convenient snack. This recipe will produce a great sweet, spicy, and smoky jerky. By starting beef jerky out in your smoker you will get an authentic smoke flavor. You can then complete the drying process in your oven or in a food dehydrator. You should use very lean meat when making jerky, such as top round steak or sirloin tip roast. This is because fat can become rancid during storage, and fat in the meat will increase the drying time. Trim any fat from the round steak. Cut the steak across the grain into 1/4-inch slices and set aside. Combine the remaining ingredients (Worcestershire sauce, soy sauce, brown sugar, garlic, black pepper, ground dried red chili, onion powder) until brown sugar has dissolved. Pour mixture into a resealable plastic bag. Add the steak to the bag and move it around in the bag to make sure it is well coated. Release any excess air from the bag, seal the bag, and marinate the steak for 1 to 3 hours in the refrigerator. Prepare the smoker for a 4-hour smoke at about 150 F.
Remove the meat from the marinade and lay the strips out on a sheet of foil. Spread out the meat evenly. Place the meat in the smoker and smoke until the surface begins to blacken, about 3 hours. The jerky will have absorbed the maximum smoke flavor by this point and you don't want any further smoke. Cover the steak strips loosely with foil. You can keep the smoke off while allowing the moisture to escape for another 1 to 2 hours of drying time in the smoker. If you prefer, after the 3 hours of smoking you can continue to dry the beef jerky in a food dehydrator or in your oven on a very low temperature. Your jerky is done when it is completely dry. Depending on your climate, this can take considerably longer (as much as 12 to 72 hours). It should be dry at the edges and have just a bit of moisture in the middle of the slice. Allow your jerky to cool completely. It will continue to give off some moisture until it is at room temperature. 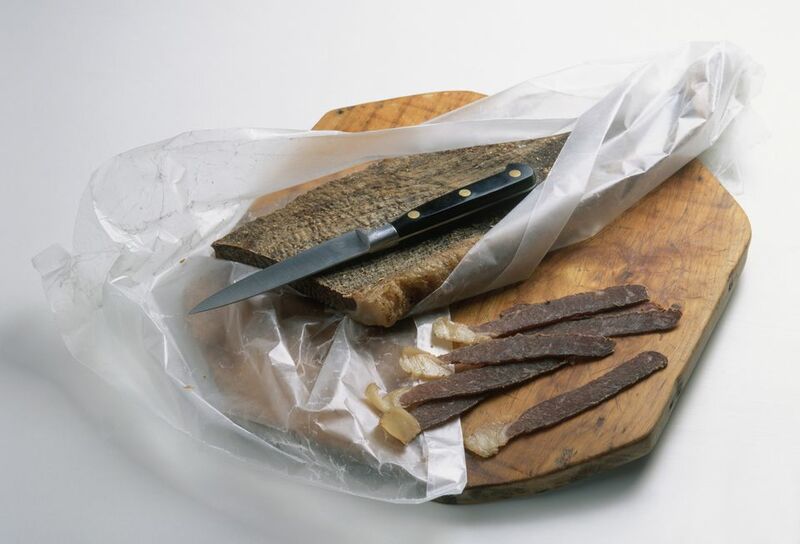 Store the jerky in an airtight container, vacuum sealed bag, or plastic zip-top bag. Label the container with the type of jerky and the date. Keep it in a cool, dark place or in the refrigerator or freezer. Unrefrigerated jerky should be good for a week to a month. Refrigerated it should be good for six months, while if frozen it should be good for a year.